The ninja were trained in secret schools using only a few books, written in code. The _Shoninki_, is one of these coded manuals, presenting the arts of concealment, espionage, and survival. 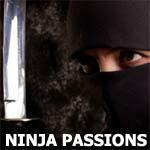 This classic text confirms the path of the ninja as an authentic spiritual discipline.